The Lands of Mythron has finally been officially revived and overhauled! :D So I made this little build to get my story kicked off again. Dark gray clouds gathered low on the horizon, roiling and rising like cobhog soup over a fire. One could not yet hear the thunder, yet the resulting silence felt oppressing. Closer, a low buzz of excitement spread through the crowd. Their anticipation was high. Even the wind seemed to be holding its breath, and the air was as taut as a fully drawn bowstring. It was fitting, Arck thought. What better atmosphere could there be for the final match of an archery tournament? Arck eyed his opponent, who stood several feet away from him, calmly running through the motions of drawing, nocking and firing an arrow. She was fourteen at the most, Arck thought, though he knew looks could be deceiving. At a glance, she looked human, but upon closer inspection, Arck could spot traces of other species: Her ears had a slight point to them, her fingers were gnarled, her nails almost resembling claws, and her skin had a slight red tint to it, giving her an appearance which Arck found to be eery. Arck was apprehensive of the match that lay ahead. 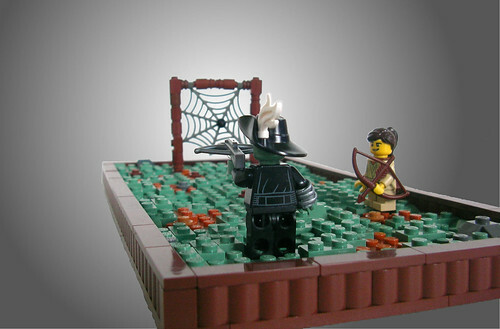 In the previous rounds, his opponent had beaten several archers of the Larpang militia, a feat that Arck was not sure he could match. The tournament was organized into brackets, and the random seeding had given him a series of easy opponents. This match was his first real challenge. The organizers of the tournament had chosen their target well. The net of the woodred spider was strong and resilient. Arck thought back to his childhood years, when he had spent hours watching his mother beat away at the pesky webs with a stick to remove them from the hut. It would likely take a dozen arrows before the web became unusable as a target. The game was simple. 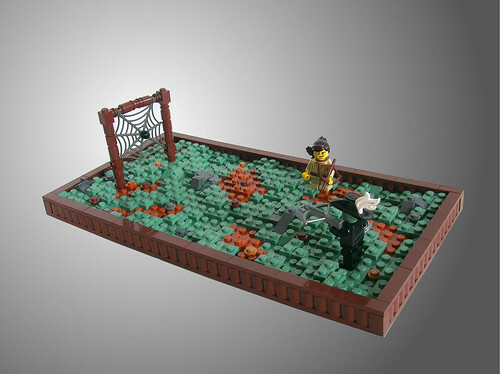 The first contestant to hit the spider would be declared the winner of the tournament. To determine who went first, they had flipped a coin. Arck would be shooting second. Everyone shifted their attention to the little girl who had outperformed Larpang�s best archers. With no hesitation, she drew an arrow from the quiver slung over her back, took aim and let loose. The arrow arced through the air, disappearing for a moment against the gray horizon before tearing through the net only inches away from the spider, which scuttled off in fright and found a new perch towards the edge of the web. The crowd burst into excited shouts, then spontaneous applause. Without acknowledging the onlookers, the girl, Phir, turned towards Arck, fixating on him with a steady gaze. �Your move, Arckera of the Turhak clan,� her stare seemed to say. Arck took a deep breath, then lowered himself down onto one knee, raising his loaded crossbow to his shoulder. Carefully, he shifted the weapon until it aimed directly at the spider, situated comfortably near the left pillar, then shifted his aim slightly to adjust for the north wind and the distance of the target. Before he could second-guess if he had made proper adjustments, Arck squeezed the trigger. The bolt embedded itself in the wooden pillar with an unsatisfying thump, sending vibrations through the net. The spider, barely fazed, remained in its position. The crowd broke into disappointed muttering. Frustrated, Arck threw his crossbow to the ground and drew another bolt from a quiver fastened to his boot, then set to reloading the bow. Without waiting for the crowd to calm, Phir nocked another arrow. This time, she moved slower. She appeared to have identified the mistake in Arck�s aiming and was trying to avoid making a similar one. She shifted her grip on her bow, moved the bow slightly left, slightly up, slightly right again. Then she stopped moving, and for a moment the entire world seemed frozen. Arck caught himself holding his breath. Not a single onlooker moved a muscle. Phir let the arrow fly. It tore through the net and dug into the ground fifty feet behind the target. The people in the crowd craned their necks to see if the spider was still on the web. With slow steps, the announcer approached the spot where the arrow had embedded itself in the grass. He picked up the arrow, then raised it high into the air. Embedded on the arrow was the woodred spider. Arck kicked at the grass in anger. He hadn�t even gotten a second chance. With a bitter look in Phir�s direction, he snatched his crossbow out of the grass and stalked away from the competition grounds, headed back toward the city center of Larpang. He was too frustrated in his current state, Arck decided, to pick up the prize money for having won second place in Larpang�s annual archery tournament. He would go back later to retrieve it. In his self-absorbed state, he barely noticed the lean figure wrapped in a dark green cloak which brushed past him just as the first drops of rain kissed the grass and headed towards the podiums, where Phir now stood with her arm outstretched, brandishing a golden medal in front of the crowd like a warrior would the head of an enemy. Rain slowly obscured both her and the cloaked figure from view. It was not until Arck entered the maze of dark alleyways that was Larpang�s inner city that he managed to calm down. The most highly skilled archer of the Turhak clan, beaten in two shots by a fourteen-year-old child. It was an outrage. Fully drenched now by the downpour which had so long been approaching, he stood still, breathing slowly. Just a quick build to continue story and keep my hands busy. The story introduces two new characters, both of whom will be quite important in events to come, though they won't be seeing each other again. I am now working on two separate story-lines, one which continues the adventures of Qinon and Elias (and a third character soon to be added), and one which follows a crew of explorers as they voyage eastward in search of new lands. Story-cards for both story-lines are coming soon. Very well done ground work, and the story was good as well. I give this 6 points. Simple, but a nice MOC. I also give six points. Can I score even if I'm not a staff? If so, 6 points.